The RC Kite Craze - Combining Kites And RC Flying. An RC kite is pretty much what it sounds like. That is, a kite-like aircraft fitted with RC (radio control) receiver and pulled through the air with a propeller. In structure, it has a lot in common with kites and yet it is flown around like an RC plane. Flying a kite by remote control was a concept first embodied as the IFO (Indoor Flying Object), developed in the U.S.A. by WildRC Inc. Their prototype flew in 1997. IFOs still enjoy an enthusiastic following today, particularly in the U.S. Since the year 2000, a similar product has been developed by Mr Michael Lim from Singapore. However, this was no mere 'knock-off'. The RC Kite was also the result of careful and extensive research and development. See the photo over there of the Pro III entry-level kite. Mr Lim was formerly a jewelry designer but now finds it hard to drag himself away from further development of these amazing little flying machines! Actually, my wife knew about these kites before I did, but that's because she is from Singapore. A crowded city-state-island in South-East Asia, it has an enthusiastic and growing crowd of kite fliers. Both conventional and RC! In typical Singapore fashion, the scene is very organized with simulator training, a ranking system for fliers and scheduled events. This city runs like clockwork. I know, I've been there! Pilots of all skill levels can be seen flying at a central location on Fridays and Saturdays. I should add, only a well-trained pilot can do all the above! 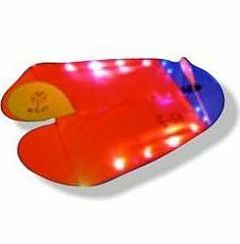 The first design from GoFlyKite was named the FireFly and emerged onto the market in the year 2000. This kite featured LED lights around its rim for night flying. The effect gave a lot of pleasure to both the fliers and those looking on. 2001 saw the next generation of kites, named Golden Ingot. But Mr Lim didn't rest, finally bringing out the popular Pro III which is the current entry-level kite. The original colored-LED lights idea has persisted, making night flying a big part of this silent kite-flying phenomenon. In fact, many Singaporeans refer to these craft as LED kites. 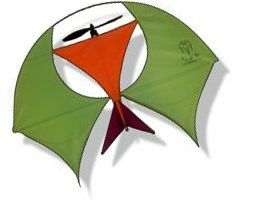 Other kites have been developed too, for specific characteristics. For example, that green and orange Scorpion pylon racer up there. The frame and RC housing of the kites are made from carbon fiber. That's the same material that is used for the very best spars in ordinary kites. Strong and yet very light. The sails use polyester canvas which resists scratches and tears quite well. Although Singapore is the hot-spot, being the place where these kites were most popularised, cheap knock-offs have been around for several years. Is that really surprising? I don't think so! Hence the flying of RC kites is not unknown in other parts of the world, where it is sometimes known as the air kite. However, the cheapies don't perform like the much more expensive IFOs or RC Kites. This is also not surprising! In particular, decent radio gear is used with these designs which are considered model aircraft, not toys. In 2008, people's video of flying events and gatherings are increasing awareness of the RC kite. Some excellent flying can be seen on the Web! It's fascinating to watch real precision aerobatics and also the very slow flight capability of RC kites. Also, membership of the GoFlyKite flying community comes with purchasing the Starter Kit. Well, my first reaction to reading about this whole scene was similar to most people's reaction to those tiny indoor RC aircraft. That really looks like fun! With miniaturization as advanced as it is now, something like this had to happen sooner or later. Also, flying indoors takes away a lot of the limitations that the weather imposes on outdoor RC flying. In my twenties I did have some experience with RC aircraft, mainly trainers and gliders. Flying in small spaces with micro RC airplanes was science fiction you could only dream about! Another fascinating area of model aircraft is the flying of tiny RC helicopters. Get one of these and start teasing your pet cat! I guess for some successful RC fliers, used to the noise and speed of powerful fuel-driven RC planes, these kites could seem a bit tame. A floating kite just doesn't re-create the feeling of 'flying an aircraft' like a fuel-powered RC plane does. At over 600 Singapore dollars for the starter kit, these are not toys, as already mentioned. However, these kites do appear flimsy and toy-like at first. Only after looking into it a bit more do you appreciate the achievements of those involved in developing the unique technology. Also, watching expert piloting helps illustrate how good the technology is! On reading all about it at the GoFlyKite website, I noticed a tendency to talk up the product as a way of freeing oneself from the flying lines of ordinary kites. There was an air of 'these have so many advantages over ordinary kites'. I personally don't think there's any kind of competition going on. RC kite technology is far closer to RC models than kite flying. Particularly in light of the trend to lighter and smaller RC models of all kinds! RC kites are just a particularly unique branch of those little RC craft. Flying tethered kites has a uniqueness all of its own, which some people will always prefer. RC flying is a world apart with a totally separate set of attractions. And another point, while I'm on my soap-box here... :-) The organized flying events in Singapore use much 'RC flying' language. The atmosphere is more like typical weekend RC club flying at the club grounds than a kite festival with people wandering through. There. I've got it all off my chest now. Don't get me wrong, I still think these kites are wonderful! It's possible you're wondering why I'm even bothering to write up the RC kite, since it seems to have more in common with RC aircraft than with normal tethered kites. Well, the construction is very kite-like, with the sail fabric stretched between a surrounding frame. This isn't much like the well-known diamond kite in the West, but it does have something in common with a particular class of traditional Chinese kite. I'm talking about those kites that have molded bamboo spars and hard edges. On the other hand, the vertical fin of the Pro III does look more like a model plane fin than the flexible keel of a kite! In any case, everybody is calling these things RC kites, or air kites so kites they are! Hence they deserve a spot on my website.